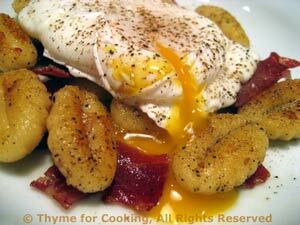 Poached Eggs with Fried Gnocchi, Thyme for Cooking gourmet starters. Gnocchi, boiled first, then fried, gets a wonderful, crunchy exterior. We add 2 slices of chopped Prosciutto and top it with a poached egg. You could also use spaetzle or small dumplings. Heat water in a medium pot for gnocchi. When boiling, add the gnocchi and cook just until they all float, 1 - 2 minutes. Drain and rinse lightly with cool water. Heat butter and oil in a medium nonstick skillet over medium-low heat. Add gnocchi and sauté until light brown, stirring and turning occasionally, 12 - 15 minutes. Roughly chop Prosciutto and add to skillet when gnocchi is first starting to brown. Fill a medium skillet with water. The water should be at least 1 1/2 inches deep. Heat water over medium-high heat. When water is softly boiling, reduce heat and poach eggs: one at a time break egg into a small saucer. Swirl a spoon in the water where you will put the egg - off to the side. When water is swirling drop egg into center of swirl. With slotted spoon try to keep the white together. With regular spoon scoop some hot water over tops of eggs. Poach for 3 minutes or until white is set but yolk is still very soft. Remove eggs with a slotted spoon. Arrange gnocchi and Prosciutto on small plates. Top with a poached egg, salt and pepper, if desired. Serve.